The first GPS collar designed to fit smaller dogs, the T 5 Mini tracking collar packs high performance into a compact design that is waterproof, durable, and offers a range of up to 4 miles. The T 5 Mini collar will work with either an Astro 320 or Alpha 100 handheld receiver. Don't be fooled by the smaller, more ergonomic size of the Garmin T 5 Mini GPS tracking collar. This device has all the features and capabilities of its big brother the T 5, as well as the added benefit of Sleep Mode, an option to conserve battery life and pause tracking without physically turning the collar off. 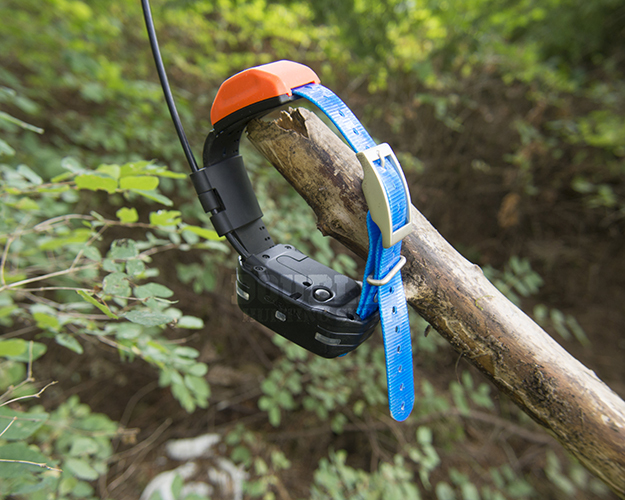 This new offering from Garmin is just right for hunters with smaller dogs or puppies. The T 5 Mini tracking collar is suited for any dog under 50 pounds and comes with a ¾-inch collar strap that fits neck sizes between 9.5 and 14 inches. The device weighs just 7 ounces. The T 5 Mini is yet another collar in Garmin’s lineup that is equipped with a connection to GLONASS. GLONASS offers an additional set of satellites to connect to beyond the standard GPS satellites, effectively cutting the chance of losing satellite communication in half. The Garmin T 5 Mini tracking collar comes standard with a durable 18 ½ inch braided steel antenna. Another way to conserve battery life with your T 5 Mini is to manually turn on Rescue Mode from either your Garmin Alpha 100 or Astro 320. Rescue Mode turns your update rate down to 2-minute intervals when the battery life drops below 25 percent, hopefully allowing you time to recover your dog from the field. The Garmin T5 MINI uses a ¾” wide D-Ring collar strap available in many different color options offered by Double U Hunting Supply. It is quick and easy to switch out collar straps with no tools needed. Just slide your favorite colored collar straps through the integral channels on the Garmin MINI T5. Linked to an Astro 320, the T 5 Mini allows you to program a 4 digit code that unlocks the collar for tracking. This code must be entered before someone else can track that T 5 collar. 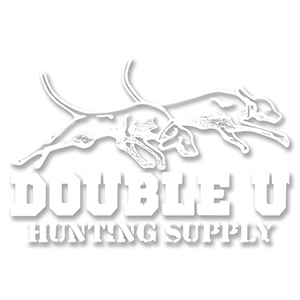 While this may not be crucial during a normal day-to-day hunt, it could prove priceless while competition hunting, hunting with or around large hunting groups, or in the presence of someone with ill intent. When linked to the Alpha 100, the T 5 utilizes the same track and train codes as other Alpha compatible devices. 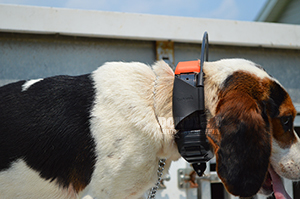 When the T 5 Mini GPS collar is put into Sleep Mode, transmission from the collar to the handheld device will cease, allowing the collar to conserve battery life. 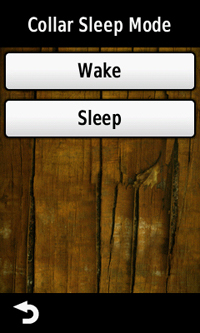 While in sleep mode, the collar will still be in connection with satellites, allowing you to immediately resume tracking when the T 5 Mini is woken up. This feature is great when dogs are in or on the box while traveling from one point to another. The T 5 Mini tracking collar antenna sleeve protects your antenna from wear and tear and also keeps it erect and receiving satellite signals. This thick rubber sleeve will have you saying goodbye to zip ties and electrical tape and hello to an easy-to-clean, durable antenna that stays upright without all the trouble. When the T 5 Mini is linked to the Garmin Astro 320, you can track up to 10 collars, which includes the T 5 Mini, T 5 Standard, TT 15 Mini, TT 15 Standard, DC 30, DC 40, or the DC 50. When the T 5 Mini collar is paired with the Garmin Alpha 100, you can track up to 20 collars and other handhelds, including the T 5 Mini, T 5 Standard, TT 15 Mini, TT 15 Standard, TT 10, or other Alpha handhelds. 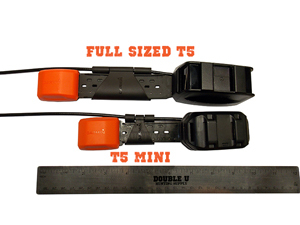 For additional information about the T 5 Mini tracking collar, please read our Garmin T 5 Mini collar review. Whether you want to get your puppies used to wearing tracking and training collars, or you struggle to fit your adult dog with the standard-sized collars, the Garmin T 5 Mini GPS tracking collar will be a valuable asset for all of your training needs. Purchase one today. What’s in the Box for the Astro MINI T5 collar?